Looking east. As I understand it, this is from the Martin Avenue entrance. If I understand my notes correctly, the bottom view was taken from a balloon by someone named Bostwick, who took photos for Charles W. Martin. Notice pole lines in the center of the top image. There appears to be a large building in the background. Could this be the waterworks? In the bottom image, the photographer's elevation is higher. The Missouri River is easier to see (in the left half of the photo). Starting from the bottom of the photo working up, there is a street running from left to right (north-south). Judging on the general appearance that it could be much wider, this could be Minne Lusa Boulevard. This is a guess only. It is known that several of the houses on Minne Lusa Blvd (if not all) were the original homes built there. Therefore, the wide boulevard would have to be in the original plans. 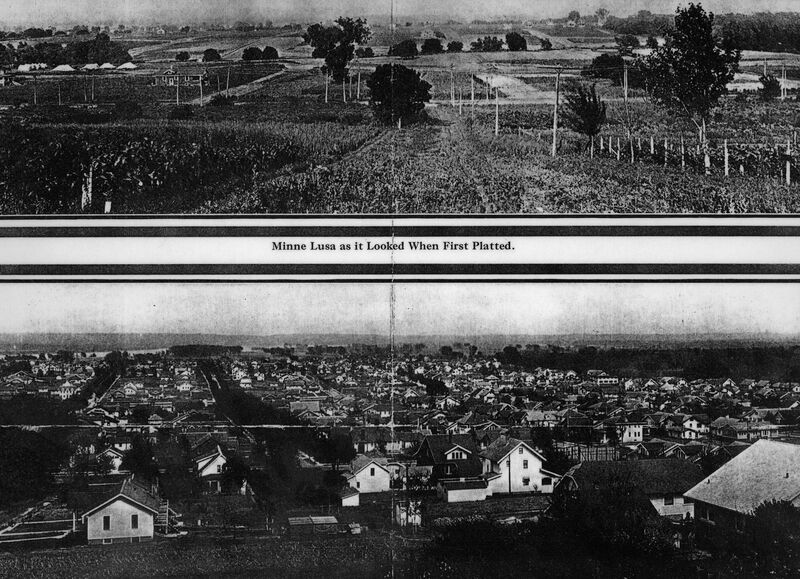 Minne Lusa when first platted (1916) and after seven years (1923).